Saturdays | July 6, 13, 20, 27 at 7:30 p.m.
Sundays | July 7, 14, 21 & 28 at 2:00 p.m.
Thursdays | July 11, 18 & 25 at 7:30 p.m.
Based on J.M. Barrie's classic tale and featuring an unforgettable score by Morris "Moose" Charlap and Jule Styne with lyrics by Carolyn Leigh and Betty Comden and Adolph Green, Peter Pan is one of the most beloved and frequently performed family favorites of all time. This high-flying Tony Award-winning musical has been performed around the world and delighted audiences for 60 years. Peter and his mischievous fairy sidekick, Tinkerbell, visit the nursery of the Darling children late one night and, with a sprinkle of pixie dust, begin a magical journey across the stars that none of them will ever forget. In the adventure of a lifetime, the travelers come face to face with a ticking crocodile, a fierce Indian tribe, a band of bungling pirates and, of course, the villainous Captain Hook. Featuring the iconic songs, "I'm Flying," "I've Gotta Crow," "I Won't Grow Up" and "Never Never Land," and a rousing book full of magic, warmth and adventure, Peter Pan is the perfect show for the child in all of us... who dreamed of soaring high and never growing up. 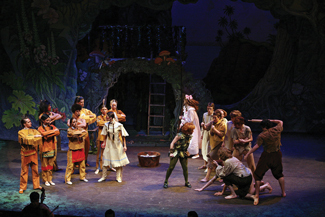 Peter Pan is a dream come true for theatres looking to spread their technical wings and entertain countless families. Assisted Listening devices will be available for all performances. Open Captioning will be available at the July 18th, 20th, & 21st performances of Peter Pan.